You may think you have the components of the song, ask yourself these final questions to see if you can improve your song in any way? Does your song build and get more interesting as it goes through? Could you add some riff to energise the song? Does your song have a hook? A short phrase or piece of music that sticks in the mind. Is there a phrase in the song that doesn't sound quite right? Is there a rhyme which sound a bit off? Are you sure nothing can be changed for the better? Many songs are spoilt by being over written? Is there anything that you can take out without losing anything from the song? Could the accompaniment work better? Is the rhythm in sync? Does the overall message of the song clear?Is everything well balanced when you hear it? How is the drum pattern? Could an off beat pattern work better? Would vocal harmonies add to the song. Is two or more voices better than one? Can you identify what can make the song better? You need to finish off your song. You will need to either perform your song or record it. Some apps or programs you can use. This needs to complement and lead into your chorus. Are your verses setting the scene? Are they developing a story? Can you lead the verse into the chorus section of the song? Do you need to use a bridge to assist you in this process? To develop the main melody/tune/vocal line for your song. To develop the main hook or riff for your song. Improvise lines of a tune, or to rap verbal phrases in a rhythm which fits your chord progression. Try putting words or phrases to it. Repeat this sequence, try new ideas which work with the chord progression. Your chorus is your hook you need to make it so you can sing along to it and make it interesting. Repeat one or two lines in the chorus, or repeat a line with a very slight change (perhaps in the harmony). Include a line from the verse in the chorus. Check what you have is a chorus. Could it be a different section? To learn how to come up with ideas for melodies and chords to use for your song. ​To understand what a chord progression is and how it is the basis for all songs. 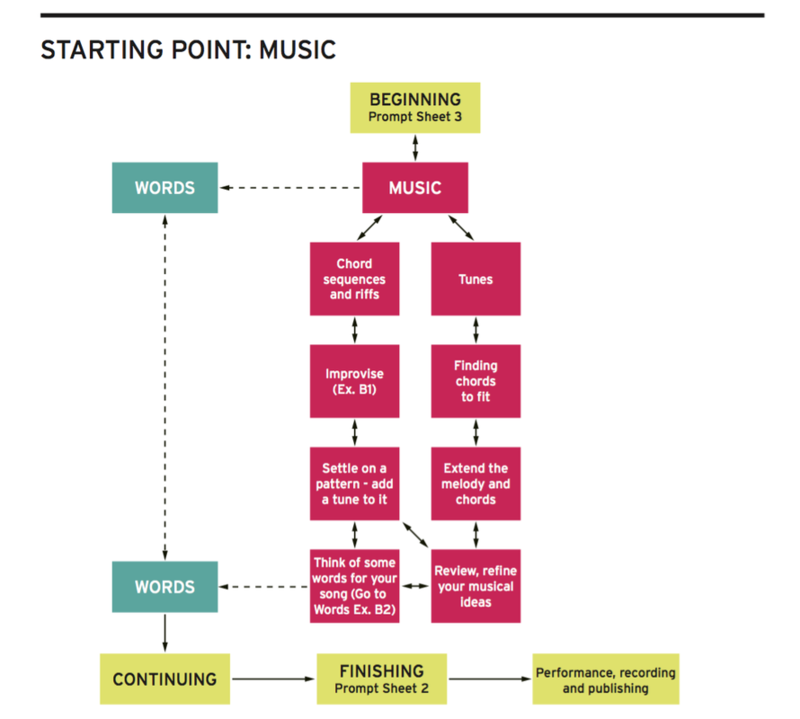 To learn how to improvise and “jam” in order to produce initial musical ideas. Improvisation, scale, chord, progression, melody. What is the most popular chord progression? What does the term "melody" mean? What does "improvise" or to "jam" mean? 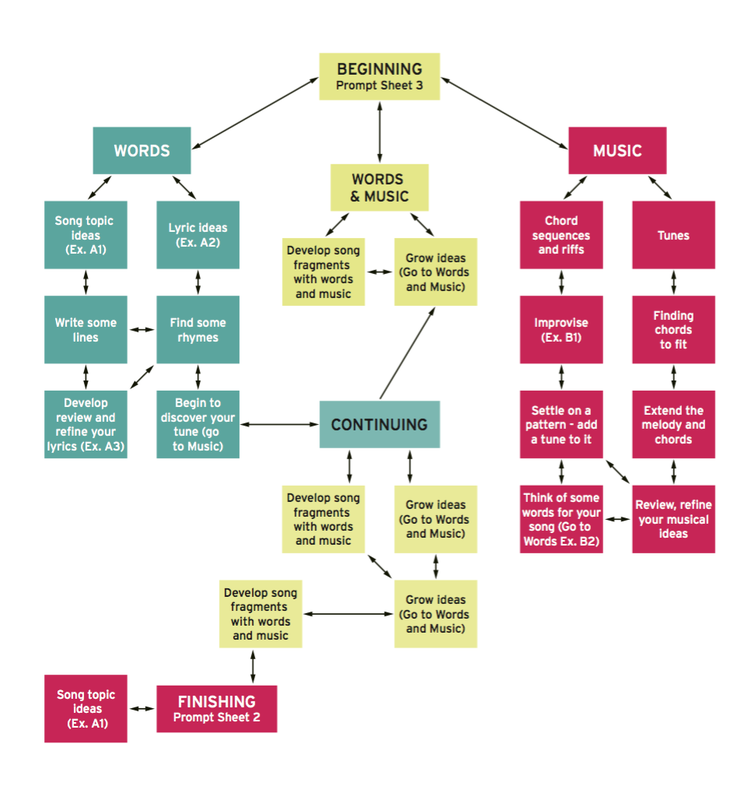 Is it best to be complicated or start simple when songwriting? MR H will test using Kahoot at the end of the lesson. Playing music with others is as much about teamwork as it is about the music you play. It is always easier to start with a very simple melody, chord progression, bass line, or drum pattern, and then add more complexity and depth to it as the song progresses. Most songs are based on a simple chord structure. The four chord hit wonder. If we take the scale of C major. We can use the scale to explain the common and different chord progressions. There are common patterns that are used. A video explanation from me. Please be nice. Most musicians, when jamming, spend the first part of the song “figuring it out” and then spend the later part of the song actually expressing themselves and creating their own variations. Until you get comfortable with a song’s basics, it won’t help playing complex solo lines or fills. If you’re the “leader” or if you feel that your fellow songwriters are with you, you might be tempted to start out with more complexity. Avoid this, because it helps to get everyone understanding and playing the first verse or two with something really simple, and you can spend that time coming up with a really amazing part that you can play later on. Most songs use only four chords look at the "Axis of Awesome" that illustrates this. Pay attention to what others are saying and to the music that is being played around you. Add to it only when it is necessary. You should begin to hear the lines that you want to play before you play them. It is important for everyone to contribute. It doesn’t matter how good you are (or think you are), you should never play so much that it drowns everyone else out. Take time (and stop playing...yes , that means you too!) and let everyone have a say about the part of the song you are working on. Sometimes you can spend a whole lot of time working on a section and just get nowhere. It happens to everyone. Maybe you are over thinking it or trying to play something that won’t fit or is just too hard for everyone to play. Drop it for a while and go on with something else. You will come back and find something that works later. Use your Voices or instruments jam around a sequence that is familiar. If you like a tune or a melody, repeat it, loop it around to help the flow. ​If you already have an idea for a melody (with or without words), find the chords of the backing that should fit with it. Play the song through and use the information to answer the questions. 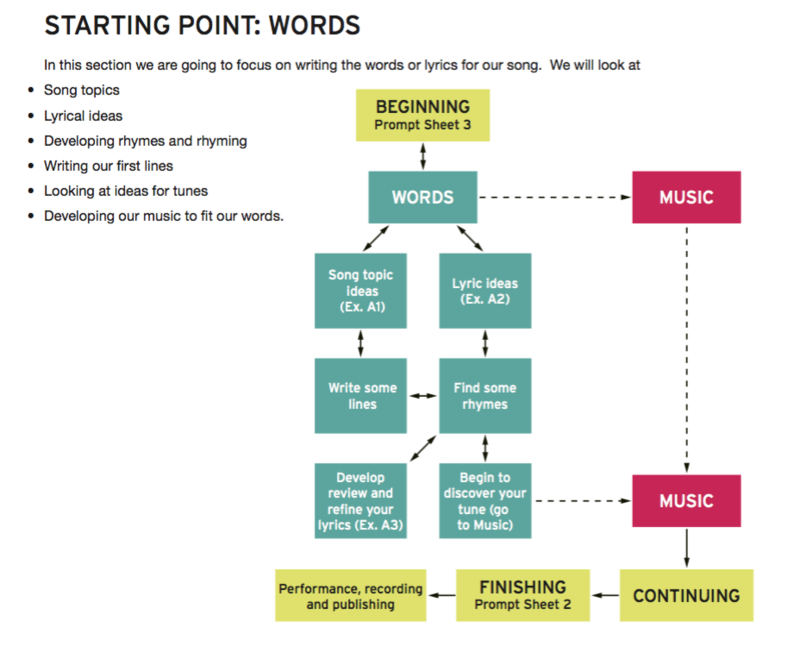 Continue to work on your lyrics in groups. At the end of the lesson, you will be expected to share some of your ideas to the class. Whether a song involves writing lyrics first or the music or both at the same time. Divide yourself into groups, a maximum of 3 in a group. In your groups choose a topic on which to write a song and discuss it. Use the prompt cards to assist you. Assign one person in your group to write down or recording any interesting ideas that could be used to inspire the song and its lyrics. Some of the words and phrases chosen may later be used in the song. Think purely about the topic. That is worth repeated listening"
Start coming up with some ideas maybe even some sections in the music. Put your topic ideas on the padlet. A song that describes a situation or a moment in time. Spend some time saying aloud, in rhythm, the words you have written. Work on these, adding and taking away words until they have two lines that work well together as lyrics for a song. Next, using exactly the same rhyme scheme and rhythm, write another two lines. Continue the pattern (or choose another pattern) to grow the four lines into a longer section. The Second of the two-line groups will usually have new words, but could have the same music as the first two lines. However, you could change the music at the end to make a slightly different second half of the fourth line. Come up with topic ideas or themes for your song. Fill out the google form with your ideas for subject topics for your song. Like I said, the top music producers in the world are using technology to help them write songs. Some apps I have listed here. Please feel free to comment and leave your own ideas of good apps on the market. Plus - A good you tube video on Beatboxing if you don't know how to. Garageband, has lots of cool features, but the iPad version is not as comprehensive as the desktop version. Although it has a lot of cool features, it will allow you to record simple melodic ideas. Launchpad, Is such a great toy and works well with the iPad. It is a simple sample editor, but it is intuitive and easy to use. Most of all it is free and it allows you to add your own samples. Keep it simple with your song, most songs are based on four chords, and often the same four chords. The video at the end demonstrates that.